Shari Redstone has urged for the recombination of CBS and Viacom — the two media empires her family owns — for the better part of two years. Redstone’s on-again, off-again desire for a merger took another turn on Tuesday, with National Amusements, her family’s holding company, saying in a court filing she “no longer supported” the recombination. This came after Redstone snatched back control of Viacom in 2016, following a messy year-long trench war with former CEO Philippe Dauman, and almost immediately turned her attention to protecting the company from an uncertain future. The courting has been tumultuous, to say the least, and in recent weeks Moonves’ opposition to the deal has seemingly strained relationships and possibly changed the direction of the two companies. Here’s an in-depth look back at how CBS, Viacom and the Redstone empire got here. Fresh from wresting away control of Viacom earlier in the year, Shari Redstone and National Amusements proposed a plan for Viacom and sister company CBS to merge. Meanwhile, Viacom was in the midst of a game of CEO musical chairs; interim President and CEO Tom Dooley stepped down on Sept. 21, just weeks after taking over for the ousted Philippe Dauman. Things started trending in Redstone’s favor toward the end of the month, with both CBS and Viacom forming special committees to look at a potential merger. Viacom named longtime exec Bob Bakish as chief executive on Halloween. Bakish had been with Viacom since 1997, and was bumped up from head of its international media networks. The move wasn’t an immediate panacea for Viacom shareholders, though, with the company’s stock falling 9 percent in the two months to follow. CBS continued its exploration of a potential merger, retaining Goldman Sachs and Moelis & Co. to advise the network, according to the Wall Street Journal. After push-back from CBS boss Les Moonves, and with Viacom in need of an overhaul, Redstone pumped the brakes and asks CBS and Viacom to stop pursuing a merger on December 12. Redstone pointed to Bakish’s “forward-looking thinking and strategic plan” to get Viacom back on track as a reason to hold off. Moonves got his kudos, too. Concerns about consumer cord-cutting regained steam around the media industry and companies began considering mergers and partnerships to help protect against the impact. 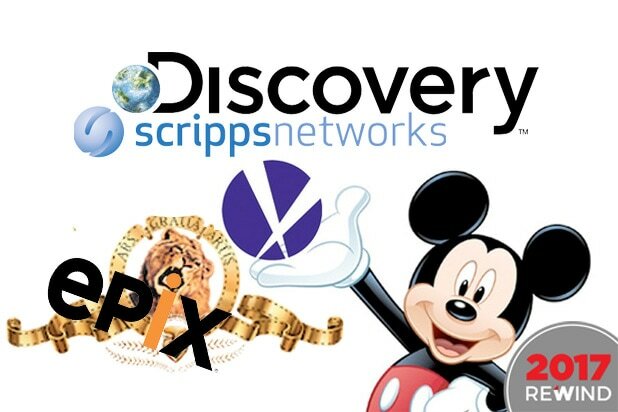 The Wall Street Journal reports July 25 that Bakish was making a play to acquire Scripps Networks. Disney announced a blockbuster move to buy the bulk of Fox’s entertainment assets for $52.4 billion. TheWrap reported Shari Redstone was once again pursuing a recombined CBS-Viacom, but this time Moonves appeared to be on board. Reports surfaced that Lionsgate was looking for a potential suitor in Amazon, Verizon and even a potentially recombined CBS-Viacom. All seems well with Redstone and Moonves, as they both sit in the CBS box at the Super Bowl in Minnesota on February 2. Both Moonves and Redstone were cheering for the Patriots. CBS extended an offer to buyout Viacom below its market value on April 3, with plans for Moonves and CBS Chief Operating Officer Joe Ianniello to run the new mega-company. Viacom countered the following week, with a $14.7 billion all-stock offer — worth nearly $3 billion more than CBS’ offer. Viacom also pushed for Bakish to supplant Ianniello as the combined company’s chief operating officer and Moonves’ successor. National Amusements shot down chatter that Shari Redstone was considering removing Moonves in favor of Bakish. “National Amusements has tremendous respect for Les Moonves and it has always been our intention that he run a combined company,” a rep told TheWrap. Redstone began reaching out to members of Viacom’s special committee, doubting the validity of a potential merger. Redstone and Moonves met to discuss Bob Bakish’s role in a combined company and whether Charles Gifford should continue to serve on the company’s board of directors following an “intimidating” moment in which Redstone said he grabbed her by the face to get her attention. 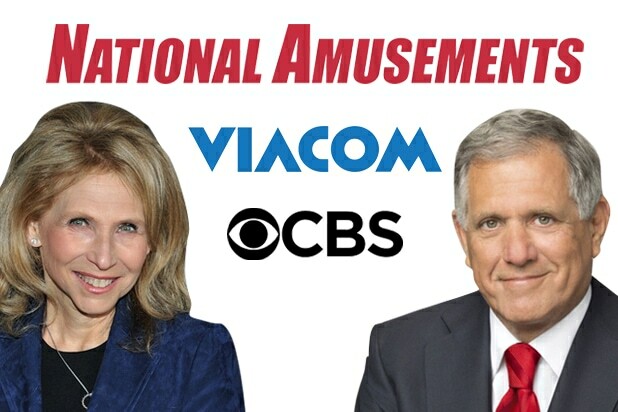 CBS announced on May 14 that it ws ending any pursuit of a merger with Viacom and filed a lawsuit against Redstone and National Amusements claiming NAI had shirked its responsibility to shareholders. CBS also filed for a temporary restraining order, voicing concerns Redstone might do more harm by replacing board members. CBS deployed an unprecedented and nuclear option, announcing a plan to issue dividends to dilute NAI’s nearly 80 percent controlling stake in the company to 17 percent. Two days later, Redstone and National Amusements change the CBS bylaws to prevent the board from diluting her stake, requiring a 90 percent “supermajority” vote for the board to make any dividend-related move. Also Read: Is Les Moonves Done as CBS CEO? Hours after a Delaware court denied CBS a temporary restraining order on May 17, the CBS board voted, without the support of the three members aligned with Redstone, to dilute Redstone’s voting power — but the decision awaits court approval in light of NAI’s change to the bylaws. The following week, CBS amended its original complaint filed with the court, challenging Redstone’s bylaw changes. National Amusements fired back in a court filing on May 29, saying CBS had made an “unlawful” maneuver to dilute its voting rights. National Amusements added that Redstone “no longer supported” a merger before CBS moved to dilute her shares.